What the heck is a Keeper Kase? I’m so glad you asked. 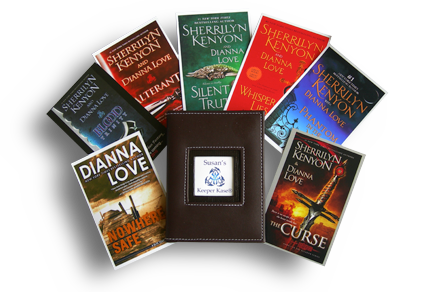 The brainchild of New York Times Bestselling author Dianna Love, the Keeper Kase® is a photo album that holds multiple 4″ x 6″ book covers of your favorite books (e- or print!). I have cards for Private Protectors Series, Risking Trust, Relentless Pursuit, Opposing Forces, Justice Team Series, Stealing Justice, Cheating Justice, Exposing Justice, Lucie Rizzo Series, Dog Collar Crime, Dog Collar Knockoff and Deadly Odds available now. Each of my cards includes the cover image, a blurb about that book and a place for me to personalize it for you. Want to receive these signed and personalized book covers?